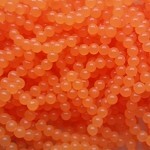 Salmon Egg Baits - artificial eggs LOADED with scent! We have several baits to choose from for Salmon fishing but our artificial Salmon Egg Baits are by far the most popular. For big kings, try our Large Salmon Egg Clusters.